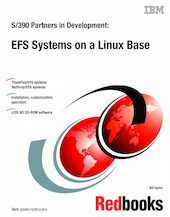 A ThinkPad Enabled for S/390 (ThinkPad/EFS) or a Netfinity Enabled for S/390 (Netfinity/EFS) are the smallest S/390-compatible systems currently available that have been tested and approved by IBM. They are based on an IBM ThinkPad or Netfinity running Linux and the S/390 emulation product FLEX-ES. FLEX-ES is a product of Fundamental Software, Incorporated (FSI) of Fremont, California. The resulting system can run current S/390 operating systems, such as z/OS. Small systems such as these are attractive for education, development, and less demanding production operations. This IBM Redbooks publication describes the installation and use of these systems, based on usage of a particular z/OS package. This package is available only to members of the IBM S/390 Partners in Development (PID) organization who obtained systems through this organization. Consequently, this document is intended primarily for this group. The information about Netfinity/EFS systems under Linux should be regarded as preliminary planning information. General support for Netfinity/EFS under Linux was not yet available at the time of writing.